General Erich Marcks stood at his long table studying the war map spread out before him. He was surrounded by his staff. They had been with him ever since the birthsday party, briefing the 84th Corps commander for the war games in Rennes. Every now and then the general called for another map. 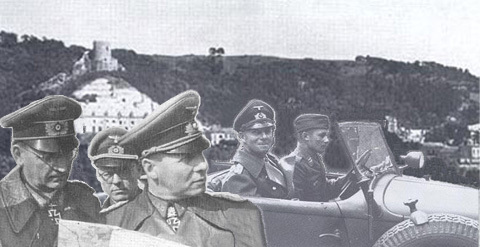 It seemed to his intelligence officer, Major Friedrich Hayn, that Marcks was preparing for the 'Kriegsspiel' as though it was a real battle, instead of merely a theoretical invasion of Normandy. In the midst of their discussion, the phone rang. The conversation ceased as Marcks picked up the receiver. Hayn recalls that "as he listened, the general's body seemed to stiffen." Marcks motioned to his chief of staff to pick up the extention phone. The man who was calling was GeneralMajor Wilhelm Richter, commander of the 716th Division, holding the coast above Caen. "Paratroopers have landed east of the Orne" Richter told Marcks. 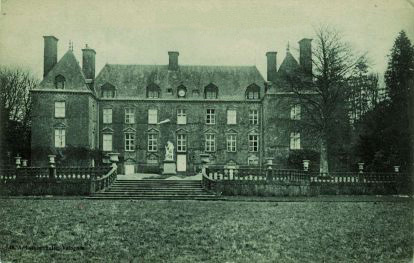 "The area seems to be around Bréville and Ranville.....along the northern fringe of the Bavent Forest..."
This was the first official report of the Allied attack to reach a major German headquaters. "it struck us" Hayn says, "like lightning." The time was 2:11 a.m. (British Double Summer Time). Marcks immediately telephoned GeneralMajor Max Pemsel, chief of staff of the Seventh Army. At 2:15 a.m. Pemsel placed Seventh Army on Alarmstufe II, the highest state of readiness. It was four hours since the second Verlaine message had been intercepted. Now at last the Seventh Army, in whose area the invasion had already begun, had been alerted. Pemsel was taking no chances. He awakened the Seventh's commanding officer, GeneralOberst Friedrich Dollmann. "Herr General" said Pemsel, "I believe this is the invasion. Will you please come over immediately?"